Bullying. Homelessness. Poverty. Family Breakdown... Qrisis - Deal With It! Qrisis came about whilst considering how to provoke a change in how children are able learn to deal with their emotions when dealing with crisis situations, such as bullying, homelessness, poverty, family breakdown. Children learn best when in a relaxed and unpressurised environment, such as during play. For such difficult subject matters, it was important to consider how this would be dealt with in a sensitive way. The card system means that only relevant and suitable content can be chosen, whether by subject matter or age. The expansion packs, mean that the game can grow with the child and also if a specific subject is required it can be chosen. With the use of QR code technology, online content can also be updated without the need to change the card system, or board or any other component. This means the game will always be current and is upgradeable. The ability to scan content directly to the child’s smart phone, also allows for the specialist online help to be readily available with the click of a link that remains in the QR code reader history. This means the child will have access to helpful sites without the need to search for them. The game itself is to raise awareness of the help that is available as much as it is to help children to share how they feel and to learn how to deal with their emotions in a positive way. 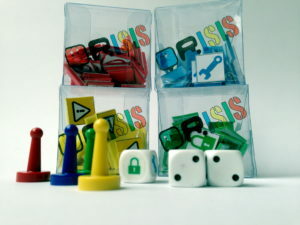 The game involves role play and simulation of crisis events. It also takes on different perspectives of the subject matter. For example, the BULLYING card set explores the feelings not only of those bullied, but also the one who is bullying and also the onlookers, all of whom are affected in some way by the action of the bully, including his or herself. The visual language of board games, QR codes and emotions have been explored. 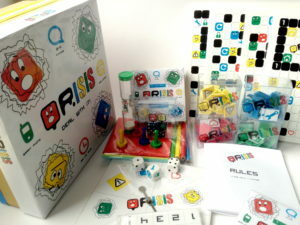 The QRIXELS (the four square characters) represent the QR code pIXELS. They are simply drawn in a primitive form and colour coded to the branding. Although they represent serious emotions (BLUE:sadness, RED:fear, GREEN:anger, YELLOW:confusion) , they are visually both playful and quite friendly. Visually, the boards when linked together look like a giant QR code, the squares are randomly placed with various symbols relating to game play. There are no numbers to follow, the movement around the board is very haphazard and random, and quite manic, reflecting a crisis, where there is often confusion and a feeling of disorientation. 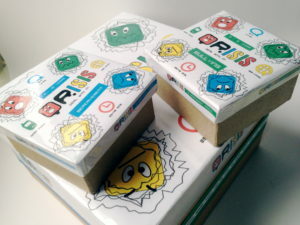 A large amount of player interaction takes place, involving telling another player how you feel, making a sound, drawing a picture, giving and receiving tokens, and this is where the game encourages the players to share their feelings. The game also allows the individual to reflect on how they feel about the imaginary crisis event. For some players, genuine feelings may be evoked, either from a memory being triggered or perhaps from current feelings about a similar crisis situation that they are actually personally involved in. The game prototype that has been developed is fully playable, with all QR code content linking to working web pages and audio/visual content. The modular four board system means players can choose to play a quicker or longer game, as they wish.